UPDATE: Fire officials say the flames were the result of two separate fires that sparked within ten minutes of each other: the first off of Sunset Peak at 3:00 p.m., and the second near Bogus Basin Road at 3:10 p.m. The causes of both fires are still unknown and under investigation. Crews from the Boise Fire Department, Forest Service, and Bureau of Land Management are still working to contain the flames. Officials say no structures were impacted. According to the Boise Fire Public Information Officer, cars are being pilot assisted in both directions of the road. BLM Officials tell us the fire is now 50 percent contained, and that there are no injuries. Crews say they will likely be working the fire into the night, but are "making progress." 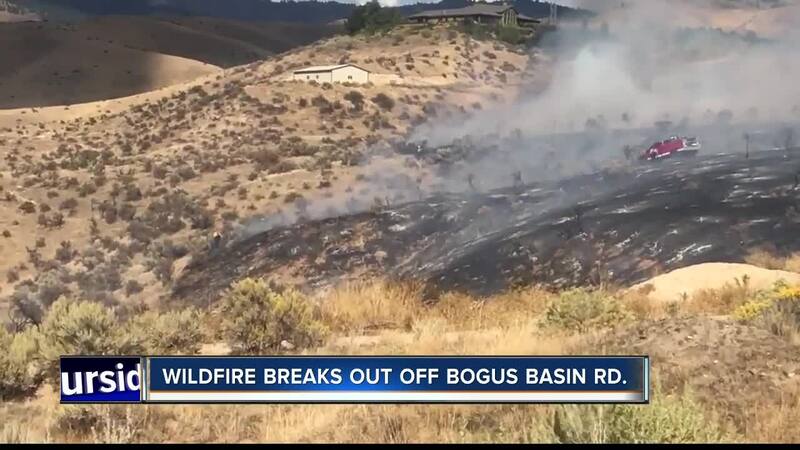 Original Story: Crews are responding to a grass fire near Bogus Basin Road and W. Becker Ridgle Ln. Bogus Basin Road is closed at W. Curling Drive due to the fire. BLM says the fire is 50 acres. Crews on scene say no structures are threatened, and crews on scene are working to secure containment. Bogus Basin Rd is closed to Northbound traffic at W. Curling Dr. Boise Fire and BLM are fighting a nearby grass fire. Drivers are asked to the avoid the area to make room for emergency vehicles. As of 4:00 p.m. active flames were visible from Bogus Basin Road. The Boise Fire Chief is on the way to brief the media. 6 On Your Side has a crew on scene. Check back for updates. Fire crews are responding to fire on the 5100 block of Bogus Basin Road. Smoke visible from Boise. More details to come.